The bride and groom stand center aisle at St. Peter's Catholic Church in Laporte, Indiana. I love photographing in the outdoors and now that temperatures are rising here in the Midwest, I'm energized for all of the weddings coming up and engagement sessions as well. However, I equally enjoy shooting inside at churches. Often times the lighting can be challenging and movement can often be restricted, but it has it's photographic rewards. Let me take you through some church weddings done throughout Northwest Indiana, Chicago and Michigan. Here are some of the things I love about them and what can make them difficult to photograph as well. Church wedding ceremonies in Northwest Indiana, Chicago and Michigan. I usually position myself in the center aisle and cover the procession while one of my second photographers is usually assigned coverage of the "reactions" - groom anticipating his bride, parents, guests, loved ones, tears, laughter and more. I can feel the nervous tension in the room just before the bride comes down the aisle and I can only imagine what the couple must be feeling. Some churches have quite the long walkway too!! We never use flash during the ceremony as it is distracting and often prohibited. If we have access, we always try to capture closeups of the emotions from family and even the bride and groom themselves. As the lead photographer, I tend to focus more on the couple getting married and the architecture shots while my second photographer (and myself too) looks for emotional moments. Oh, and I love capturing images that show off the church and the significance of the various religious symbolism. I've photographed really large churches such as St. Andrew in Calumet City, St. Stanislaus in Michigan City and St. Josephat in Chicago as well as tiny little chapels. Wonderful moments at various church weddings. Family photographs usually occur right after the ceremony. Sometimes a bubble send off occurs and then it's right back inside for pictures. If you have a limited amount of time ( most weddings do) I'd encourage you to skip the traditional receiving line at the church. Family pictures usually take awhile to organize, plus we have wedding party and couple's photos as well. Most couples go table to table for a meet and greet at the reception. I bring professional, studio quality lighting for the church family photos and couple's photos. The ceremony is now over and the pastor or priest will now allow us to use our lighting. We follow along on the shot list that you filled out. I love to take artistic photos inside the church, but simple pictures with grandma and parents, etc. are equally important. They and you will cherish these. Family and wedding party photos inside a church. The bride on the altar at St. Mary's Church in Crown Point. Often times people have been attending their church for years and often don't realize the beauty that is there. After some shots of the happy couple in their church, it's usually off to the park, beach or wherever for fun shots and romantic photos. 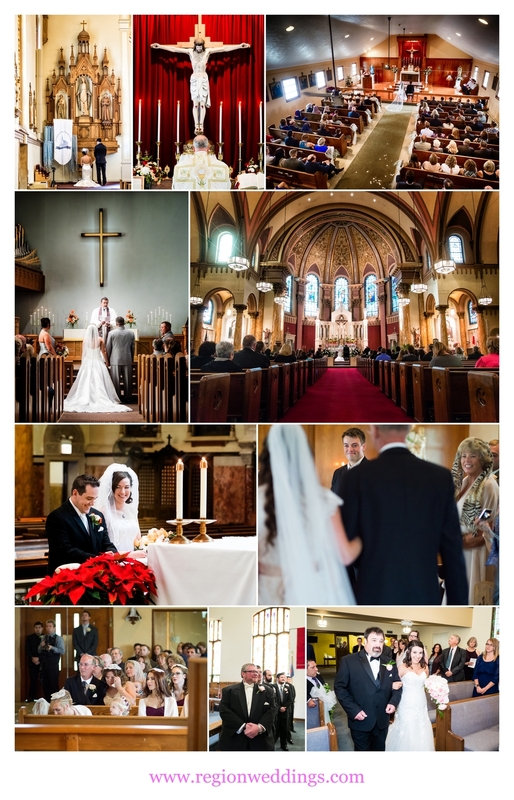 Artistic church wedding photos in Northwest Indiana and Chicago. I hope you have enjoyed this look at church weddings in Northwest Indiana, Chicago and Michigan. To inquire about your wedding date - church or otherwise - please fill out the Contact Form and I will get back with you shortly. Military guard salute at St. Mary's Church in Griffith, Indiana.